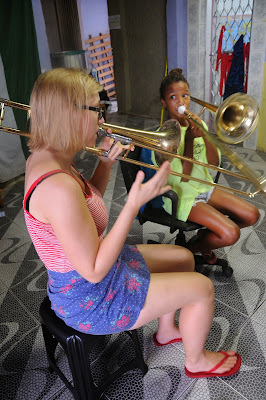 Favela Brass is growing quickly. Whether it was our parade within the favela during Carnaval, our beautiful new T-shirts, or just the sheer charm and charisma of our teaching staff (!) we don't know, but over the last few weeks we've had a constant stream of children arriving at the project to enrol. Having worked with a small group of about 10 students for most of 2014, we now have 34 students and have had to start putting new arrivals on a waiting list. The challenge now is to maintain the previous quality of teaching at this larger scale; to manage the transition from giving lessons to a few of our neighbours' children to running a music school. One implication of this increase in size is that our costs have also increased - we now need more instruments, more teaching hours and more materials. In order to try and meet this increased cost we're appealing to friends of the project to consider setting up a monthly donation. If we ended up with 100 people donating just £3 per month that would be enough to cover the cost of providing 3 music lessons and 2 English lesson per week for all of our 34 children. That is, for the price of a large cappuccino at Starbucks you could help to give 34 children a life-changing chance to learn to play a musical instrument. Those who wish to sign up for a monthly donation, please just choose the amount that you'd like to donate each month from the drop-down menu below and then click the "subscribe" button. Thanks.